The top 10 most expensive Google keywords in the U.S. from August 2014 to August 2018 are all related to the word “mesothelioma.” These keywords account for 67 of the top 100 most expensive terms during those years, according to a release from Kantar Media. 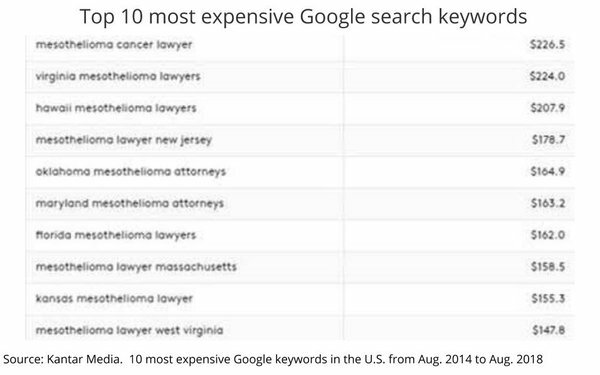 Of the top 10 Google search keywords, all included the words “mesothelioma” and “attorney” or “lawyer. Kantar notes that the trend has extended for nearly ten years. “Mesothelioma” was the most expensive keyword in 2009, averaging $99.44 per click. By 2014 the most expensive was “mesothelioma attorneys tx,” averaging $319.34 per click. In that same year, 13 of the top 20 were mesothelioma-related, generating an average cost per click of $216.17. During the past four years, the average cost per click for the Top 10 mesothelioma keywords dropped 14%, to an average cost per click of $185.86, mostly due to market conditions. For mobile keywords only, the CPC is much lower than the most expensive desktop keywords, but studies show that compared to years ago, mobile CPCs are lower now vs. desktop. Topping the list of the most expensive keywords on mobile, “business phones service” at a CPC of $103.59 on mobile. “Mesothelioma foundation” follows at $100.25, “mesothelioma lawsuits” at $92.66, and “mesothelioma lawsuit” round out the top three. Rehab and substance abuse keywords on desktop are not as high as those related to “mesothelioma,” but analyzing 162 substance-abuse keywords for Google desktop text ads in the U.S. from September 2017 and August 2018, Kantar Media found the more specific a keyword about rehab, the more expensive. For example, the most expensive keyword in the group of 162 terms analyzed was “florida alcohol rehab,” with an average cost per click of $61.73. The average cost per click was $7.38. The second most expensive in the top 20 for rehab-focused terms was “drug and alcohol rehabilitation at $52.37. “Drug and alcohol rehab” follows at $52.11 per click, inpatient drug rehab at $44.62, and “alcohol detox program” rounds out the top five at $44.33. The least expensive keywords related to substance abuse was ‘fentanyl abuse” at $0.26 and “cannabis” at 0.27.